When it comes to brick-and-mortar storefronts, local businesses often struggle to compete with neighboring big brands. Statistics show that, even for a well-known local store that’s established a strong relationship with its customers and built a community through the years, having such a neighbor can be detrimental. But what about a newly opened business? Does it have any chance of competing with popular brands? My experience has led me to believe there’s only one way a locally owned business can overcome big competition: it needs to take advantage of local SEO. Recently, in collaboration with Accuranker, I conducted a survey that touches upon the difficulties local businesses face when trying to become visible in Google’s local results. We analyzed more than 300,000 local SERPs across multiple industries (beauty, medical services, auto services, legal, shopping, etc.) to get a clear understanding of what the chances are for a local site to seem attractive to Google. One of the more curious insights our research revealed is that the legal services niche is among the most competitive. Sure, this finding isn’t rocket science. In fact, I bet on some level you were aware of this (or at least you had a gut feeling). However, this issue is much more complex than it seems. The legal services niche far surpasses other niches in terms of competition and prices. Does this mean that the legal services niche falls under radically different rules and requires unique SEO tactics? This is exactly the question I set out to answer, and you’re most welcome to follow me on my little investigation! 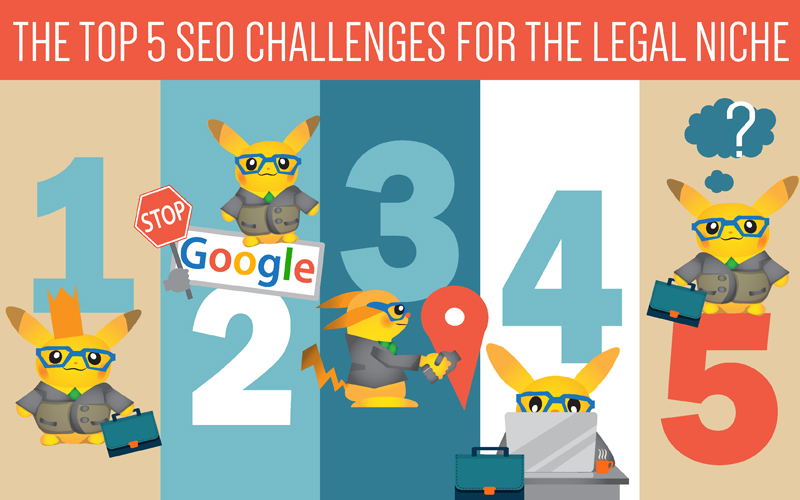 After reading this article, you’ll understand the biggest challenges that any legal website faces when trying to become visible in the SERPs. The data here will help ensure that your future strategies are based on informed decisions. Moreover, you’ll be able to streamline your creative process and find non-standard approaches that will cement your success in the legal industry. I made a list of keywords unrelated to any brand (which could hardly be classified as local). The first step was simply to do keyword research, which involved a bit more manual work than usual — I tried my best to filter out branded keywords and ones that weren’t relevant to local searches. 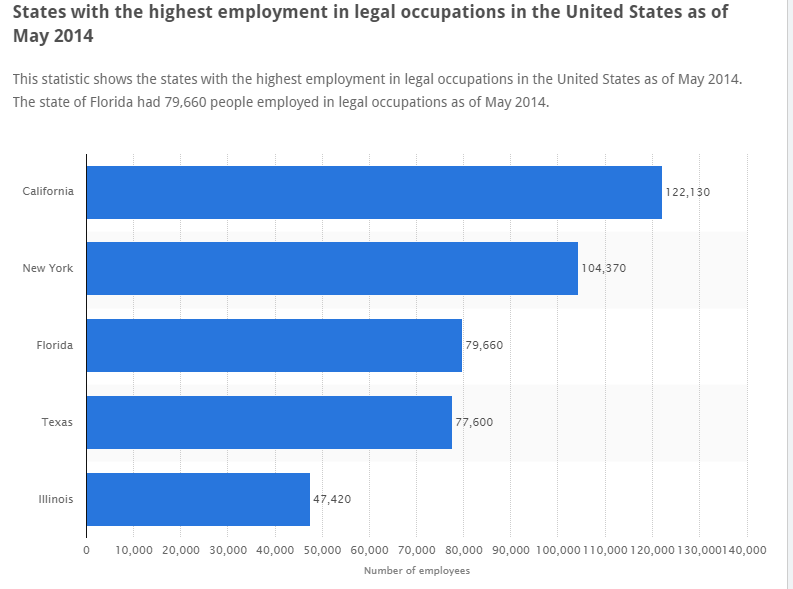 You can see that California, New York, and Florida have the highest number of employees in this industry, hence these locations are the most “densely populated” by law firms and lawyers, and, as a result, the competition in these states should be higher than in other states. After I made a list of the most competitive locations, I was ready to move on to the next step — analyzing the domains that appear in SERPs for the keywords I had previously selected. Now let’s see what my findings revealed. The extreme competitiveness of the legal services niche might be explained by the fact that this market generates more than $248 billion USD in revenue (according to a recent report provided by Statista) with only a relatively small number of searches. To give you a better understanding of the size of the legal services industry in the US, let’s compare it with a bigger market: for instance, if we look at ecommerce, we can clearly see that the revenues generated by the two niches in question are nearly the same (ecommerce sales surpass $256 billion USD), despite the fact that ecommerce traffic share figures are four times greater than in legal services. It’s safe to say that the legal niche has turned out to be a ridiculously competitive market, because it’s an outrageously profitable one. I’m also certain that the success of any SEO activity depends on a deep understanding of how the industry and its major players work. In the next section, you’ll learn about the main challenges that legal businesses face. Statistics from an IbisWorld report confirm that the online legal services niche was able to generate $4 billion USD in 2015. Moreover, in recent years this niche has been steadily expanding due to the fact that consumers are interested in getting legal services online. That’s why it doesn’t come as a surprise that a company named Rocket Lawyer generates more than 30,000 searches monthly (according to Google Keyword Planner) by helping users deal with their legal issues online. This number of searches proves that online legal services are gradually becoming popular, and people don’t want to spend their time scheduling an appointment with a lawyer anymore. Now you’re probably wondering how this trend is affecting local SEO, right? After making this list, I double-checked these websites to make sure that all of them belong to the online legal services niche. I also decided to dig deeper and manually checked the top twenty domains that were most visible across all the locations I analyzed, in order to understand what kind of legal services they provide. I found out that 55.6 percent of the sites I analyzed belong to the online legal services niche. That means that local businesses now have to compete not only with global businesses, but also with online legal businesses that, by default, have better positions in SERPs, as the main goal of their business is to increase their online presence by getting more organic traffic from Google. I also discovered that all three of these websites belong to the online legal services niche, and, despite SEO visibility, have a good number of backlinks. I am of the opinion that local businesses have no chance of competing with them whatsoever. As I studied the 20 percent of websites that are unique, two curious cases of locally based businesses caught my eye — Injurylawyers.com and Cellinoandbarnes.com. Let’s take a closer look at these two websites. My quick research proves that, in practice, Google doesn’t give priority to NY-based legal companies and still mostly relies on general ranking factors. And it seems obvious now that any online business can easily outperform an offline SMB legal company by increasing the number of backlinks, brand mentions, and site visits it receives. One year ago, Google implemented a major change that dramatically minimized local businesses’ chances of becoming visible in local packs: Google replaced the 7-pack in SERPs with a 3-pack. And I was quite interested to figure out what kinds of businesses now hold these three positions in the legal niche, and whether these results are local. Despite the fact that local organic SERPs are fully occupied by big online businesses, the local pack still is the best way to remain present in Google for locally based legal companies. My research revealed that 67 percent of sites that appear in local packs for legal services are hyper-local and local. To arrive at this percentage, I analyzed the domains that appear in local packs in New York, Miami, and Los Angeles in terms of their SEO performance in Google US (to do this, I used Serpstat’s Batch analysis tool). This was quite an insight, since I assumed that California would be the most competitive location for the legal niche, because — as you may recall from the beginning of this post — it’s the state most densely populated by law firms. Also, it’s surprising to find New York only at third place in this list. Yet, as you can see, Miami has the greatest number of local sites that are present in local pack. Therefore, I believe that being featured in local search results in New York requires a lot more resources than it does to achieve the same visibility in Miami. And this is something that every SEO expert should be aware of. It’s a well-known fact that Google’s local pack provides businesses with the opportunity to appear at the top of Google SERPs even without a website. According to my previous research, which I conducted in collaboration with the AccuRanker team, the local pack works much better for less competitive niches. What I tried to clarify here is whether you can stand out in a local pack without a website in such an unconventional and competitive niche as legal services. Unfortunately, no, you cannot. To prove this, I analyzed 986 local SERPs in order to figure out if legal brands can appear with or without a website. 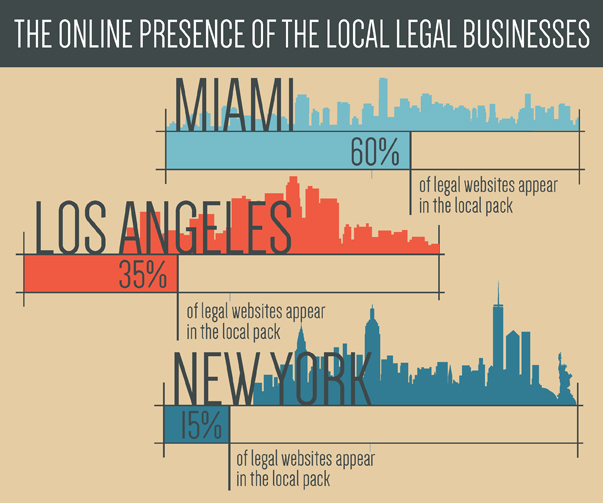 My findings showed that 86 percent of legal businesses that pop up in local packs have a website. This means that even if your business is visible in local packs without a website, in a majority of cases, it’ll be considered by potential clients as less trustworthy, since users usually expect to see a link to a particular domain. Without a link to a professional-looking website, your business will seem less credible — not only to potential clients, but also to Google. Nevertheless, it’s not unusual for large, global companies to be trusted more than small, local ones. Therefore, small companies need to instill confidence in their potential clients by having a website. I’m certain that every business owner understands the importance of customer reviews. It’s a no-brainer that a level of trust is instantly established when a potential client sees that a local business has reviews. And it definitely increases the likelihood of said client to convert. Also, the very presence of Google native reviews is thought to be among the Top 50 local search ranking factors. However, this study of legal services has already revealed that there are quite a few peculiar ranking factors that business owners need to keep in mind in order to succeed in this niche. That’s why I was curious to know whether there’s any correlation between a site’s number of customer reviews and its ranking #1 in a local pack. There’s no correlation between ranking in the first position in a local pack and your number of reviews. For instance, in New York local pack results, the companies that appear in the third position have 824 total reviews. Those that appear in the first – 732. Moreover, I noticed a good number of cases in which a company that had a solid number of reviews was ranked in the third position, while a business that hadn’t even been reviewed yet was ranked in the first. Another striking insight I gained: most legal sites never show their potential visitors more than 2 reviews. Based on this data, I can say that this represents an overall industry trend of a lack of native Google reviews. That’s why Google ranks businesses that haven’t been reviewed so highly. Even if you have a significant number of customer reviews, it won’t help your business rank higher in local pack results. Without any doubt, the legal niche presents a lot of unique local SEO challenges that other industries hardly ever face. The high penetration of online legal services into the existing legal market is changing the current business landscape — in particular, it’s drastically affecting local results. Online legal businesses are stealing an outrageous amount of web traffic from local companies, without giving them even a slim chance of ranking as well in local SERPs. Fortunately, local legal businesses still have priority in local packs, but the highly competitive environment is forcing them to improve their online presence by creating a website. Since a majority of the companies that appear in local packs have sites, your potential clients’ expectations are ratcheting up. In fact, this trend may reinforce searchers’ opinions that businesses without a website are untrustworthy. Furthermore, it seems that Google also prefers to show users local legal businesses that have a site, rather than those that don’t. The only good news is that your number of reviews doesn’t really influence your rankings in local packs. Still, if a local legal business is interested in attracting clients via the Internet, it shouldn’t hesitate to look for alternative ways of generating traffic in both organic and paid search channels.